A Large Spacious Campus spread around in 5 Acres with Natural Environment and Surrounding Area. Practical Training Ground for Physical Drill, Scot Drill, Rescue Drill, Fire Drill, Adventure Activities and Many More..
Well Qualified Staff is assigned for Administration, Academic Progress, Discipline, Well Being and Welfare of All Students. 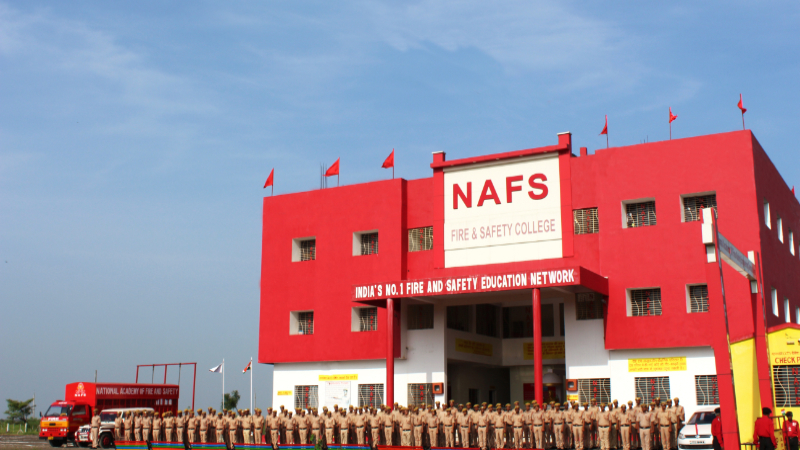 NAFS is having dedicated training team of professionals comprising Defence Officers, Fire Scientists / Engineers and Fire-Safety Experts who boast of knowing Fire-Safety from "Womb to Tomb". The Classrooms are well equipped with comfortable Sitting Facilities, Black Board and Projector etc. The Seminar Hall with Air Conditioned and Equipped with Video Projector, Excellent Sound System and Spacious Sitting Arrangements, Approximately 150-200 students. An Ever-Expanding Library of Books in Diverse Subjects of Fire-Safety, Health-Environment and Disaster Management etc. Academy Provides Excellent Residential Facility To Each Student. Hostel Blocks Consists of Spacious Dormitories. Each Dormitory is Thoughtfully and Designed and Kept Homely for The Residential Stay of the Students. Canteen Facility with Nutritious and Hygienic Eatables and Beverages. Security Surveillance with The CCTV's, Wireless and Other High Tech Gadgets. Generators for Take Care of the Power Needs in Case of Power Cuts. Suggestion Boxes for Redress Grievances of the Students and To Improve Facilities in the Academy. Copyright 2008 © NAFS India. All Rights Reserved.